Print sheets for your worship band from the same source as your presenter. You can even add guitar tabs, that will be kept at the correct position even when you resize the text! Display message alerts to your congregation without worrying about the text length. SongBeamer will scroll it automatically for you. Preview all slides before the congregations sees them. Work around presentation size limits of your projector. 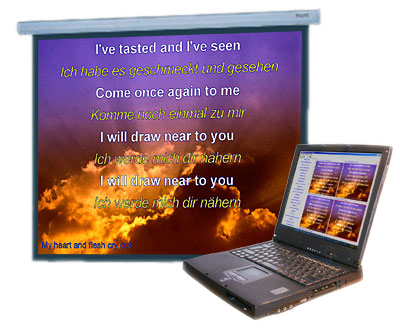 SongBeamer can scale down the presentation size for you if needed.